Fast-food workers at several restaurants in New York walked off the job on Thursday, firing the first salvo in what workplace experts say is the biggest effort to unionize fast-food workers ever undertaken in the United States. The campaign — backed by community and civil rights groups, religious leaders and a labor union — has engaged 40 full-time organizers in recent months to enlist workers at McDonald’s, Wendy’s, Domino’s, Taco Bell and other fast-food restaurants across the city. The first walkout took place at 6:30 a.m. at a McDonald’s at Madison Avenue and 40th Street, where several dozen striking workers and supporters chanted: “Hey, hey, what do you say? We demand fair pay.” An organizer of the unionizing campaign said that 14 of the 17 employees scheduled to work the morning shift had gone on strike. Over the decades there have been occasional efforts to unionize a fast-food restaurant here or there, but labor experts say there has never before been an effort to unionize dozens of such restaurants. The new campaign aims in part to raise low-end wages and reduce income inequality, and is also an uphill battle to win union recognition. Ruth Milkman, a sociology professor at the City University of New York, said there had been so few efforts to unionize fast-food workers because it was such a daunting challenge. “These jobs have extremely high turnover, so by the time you get around to organizing folks, they’re not on the job anymore,” she said. Nonetheless, she said the new effort might gain traction because it is taking place in New York, a city with deep union roots where many workers are sympathetic to unions. Christine C. Quinn, the speaker of the New York City Council who has struggled with various measures intended to improve wages and working conditions in the city, expressed support for fast-food workers. “I support fast food restaurant workers’ rights to organize and fight for decent wages,’’ Ms. Quinn wrote in a Twitter message on Thursday morning. Jonathan Westin, organizing director at New York Communities for Change, a community group that is playing a central role in the effort, said hundreds of workers had already voiced support for the campaign, called Fast Food Forward. 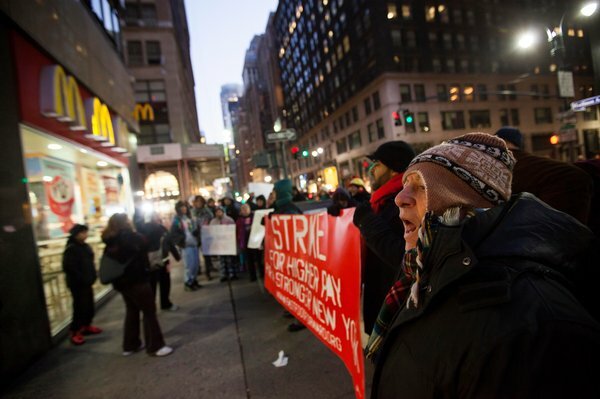 “The fast-food industry employs tens of thousands of workers in New York and pays them poverty wages,” Mr. Westin said. “A lot of them can’t afford to get by. A lot have to rely on public assistance, and taxpayers are often footing the bill because these companies are not paying a living wage.” The minimum wage in New York State is $7.25 an hour. Mr. Westin said the campaign was using techniques that differed from those in most unionization drives, and was still developing overall strategy. He declined to say whether it would pursue unionization through elections or by getting workers to sign a majority of cards backing a union. McDonald’s issued a statement about the incipient unionization push. “McDonald’s values our employees and has consistently remained committed to them, so in turn they can provide quality service to our customers,” the company said. It added that the company had an “an open dialogue with our employees” and always encouraged them to express any concerns “so we can continue to be an even better employer.” McDonald’s noted that most of its restaurants were owned and operated by franchisees “who offer pay and benefits competitive within the” industry. But workers demonstrating outside the McDonald’s on Madison Avenue said their employer paid them wages that made it difficult to pay for basics. One customer drinking coffee inside the McDonald’s said she supported the organizing effort. “If anybody deserves to unionize, it’s fast food workers,” said the customer, Jocelyn Horner, 35, a graduate student. Even with a union, it might be hard to obtain wages of $15 an hour, and many employers say they would most likely employ fewer workers if they had to pay that much. 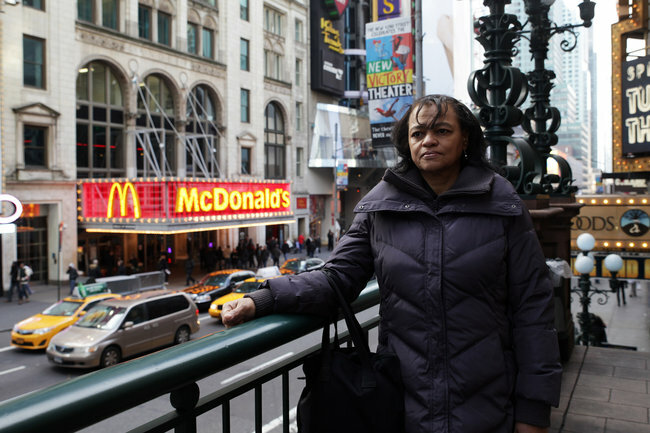 Linda Archer earns $8 an hour after three years as a cashier at the McDonald’s on 42nd Street in Times Square. “I feel I deserve $15,” she said. Mr. Westin’s group, New York Communities for Change, has played a major role in the recent uptick in unionizing low-wage workers in New York, many of whom are immigrants. In the past year, his group, working closely with the Retail, Wholesale and Department Store Union and other organizations, has helped win unionization votes at four carwashes and six supermarkets in New York. The sponsors of the fast-food campaign also include UnitedNY.org, the Black Institute and the Service Employees International Union, a powerful union that is playing a quiet but important role behind the scenes. According to the State Labor Department, median pay for fast-food workers in the city is around $9 an hour — or about $18,500 a year for a full-time worker. After three years of working at a McDonald’s restaurant on 51st Street and Broadway, Alterique Hall earns $8 an hour — and is yearning for something better. So when he heard about the unionization campaign, Mr. Hall, 23, was quick to sign on. Linda Archer, a cashier at the McDonald’s on 42nd Street just west of Times Square, said she wished she earned that much. She earns $8 an hour after three years there and averages 24 hours a week, she said, meaning her pay totals about $10,000 a year. “I feel I deserve $15 an hour,” said Ms. Archer, 59. “I work very hard.” She said she hoped a union would deliver affordable health insurance and paid sick days. “My hope is we can all come together in a union without being intimidated,” she said. TCB Management, the franchisee that operates Mr. Hall’s McDonald’s, and Lewis Foods, which runs Ms. Archer’s, did not respond to inquiries. Tim McIntyre, a Domino’s Pizza spokesman, said the few efforts to unionize its stores and drivers had fallen flat. Richard W. Hurd, a labor relations professor at Cornell, said the organizations backing the fast-food campaign seemed intent on finding pressure points to push the restaurants to improve wages and benefits. It is understood the Government wants to reduce that to four factors: inflation, wage growth based on the median wage, employment and the impact on jobs, and ”other factors” which could include changing conditions. The current review process costs about $100,000 and the changes, which are expected to be considered by Cabinet before the end of the year, would save about $60,000. Labour’s industrial relations spokeswoman Darien Fenton said principles like fairness should not be stripped from the review. Labour was concerned minimum wage increases would become inflation indexed which would lead to ”tiny” rises in some years. The $13.50 minimum wage was already less than half the $27 medium wage for men. Reducing submissions to every four years was ”cutting out the voices of people who want to have a say in this”. Unite Union national director Mike Treen said low-paid workers were already marginalised. Unite made submissions every year and felt it was an important process. Treen said the Government was narrowing down the criteria to increase the weight of the argument against raising the minimum wage each year. The changes won’t come into effect for this year’s review. Thanks to all those unions who have responded to requests to provide people to help over the weekend. 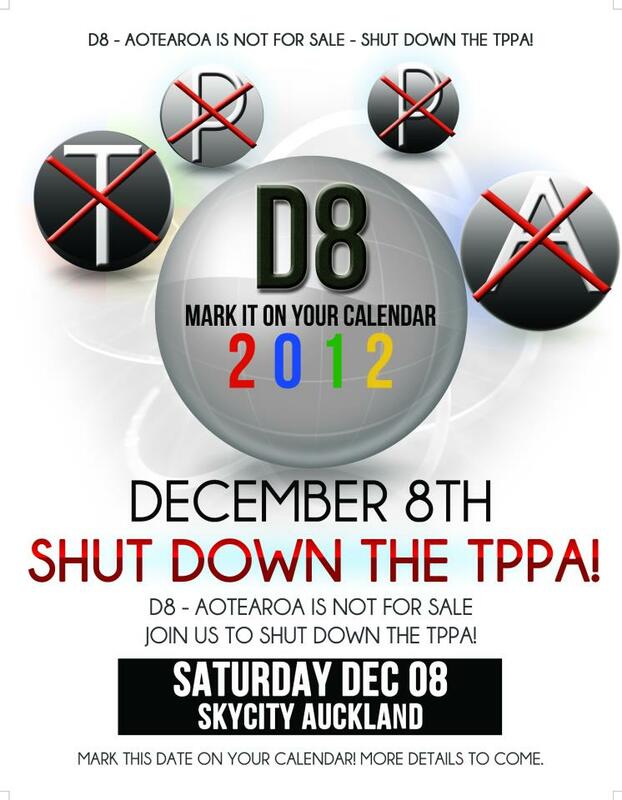 We are determined to play our part, along with Labour, Greens, Grey Power, NZ First and Student Associations. This means we do need to know what specific union resources are being involved in the raft of weekend activities. This is why Georgie McLeod, Carol Beaumont and Matthew Fitzsimmons have been ringing you. If you haven’t yet spoken to them please call Carol Beaumont on 0272757374. It is important to actually sign up on that website so the organising committee knows where we have (and haven’t) got people. Even if you can’t do the full length of time associated with each event please still sign up. If you, or someone in your organisation is organising an event, please ensure that they bring enough petition forms (PDF attached), plenty of pens and clipboards (old coreflutes make a pretty good clipboard if you’re short).We can help with the resources like petitions etc, just give one of us a call. Organising a collection point does require a greater level of commitment from the union volunteer, but is invaluable to the cause and the success of the day. If you have other events or locations that are not already on the list, and people who can organise a group of friends/colleagues to collect for a couple of hours on Saturday or Sunday, please let Carol know. Alternatively, there are still some sites without coordinators, so let us know if you have a volunteer! 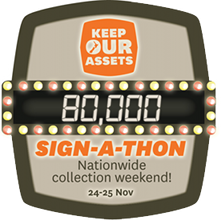 This weekend is important and we hope that it will take us over the 80,000 signatures required to ensure a citizens initiated referendum on keeping our assets is held. I know that it is a busy time of the year and that people are tired but individuals giving a couple of hours can really make a difference. Many of you have continued to collect petitions at workplaces and union events. Please ensure you forward these promptly to either Georgie at PO Box 6645, Wellington 6141, or to the PO Box address on the petition forms – we need to get all the forms in as soon as possible so we have an accurate picture of the numbers. If you have any questions please contact Carol Beaumont 027 275 7374 or Georgie McLeod 027 501 6880. OPINION: If the Government could take anything positive from last week’s unemployment figures, it would be to thank its lucky stars that those jobless numbers are being racked up in the year after the last election, and not in the year before the next one. At 7.3 per cent, the unemployment rate has hit levels not seen since the end of the 20th century. The numbers of jobless – ie, the unemployed plus those who have basically given up actively looking for work – stands at nearly 300,000. That’s before you start counting the under-employed, where the figure now stands at close to 400,000, an increase of 150,000 since the Key Government took office in 2008. And all this is before the upcoming welfare reforms push more people out on to the jobs market in search of non-existent jobs. In response last week, Prime Minister John Key suggested the statistics must be wrong, since they didn’t coincide with his "anecdotal evidence”. Four years after the global financial crisis, international events can hardly be blamed, either. 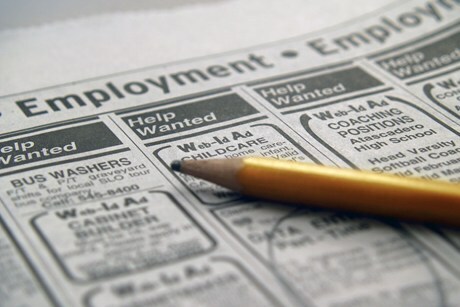 In Australia, unemployment is holding steady at only 5.4 per cent. If Australia wasn’t there to siphon off so many of our job seekers, the jobless numbers here would be astronomical. Our jobs crisis, however, is unlikely to change overnight the perception that National is a better manager of the economy. An underlying faith exists that the political party seen as being closer to Big Commerce will be more willing and better able to manage the economy for the public good. Similar perceptions exist in the United States. Until polling day in an election supposedly fought on the state of the economy, voters kept telling pollsters that the Republicans were more competent at managing the economy, but they then voted for Barack Obama by a reasonably comfortable margin. Economic faith seems to have got disconnected from political action. Generally speaking, one has to ask on what rational basis do voters – here, in the United States and in Britain – form the belief that the centre-right has a better grasp of the issues of economic management? One reason, of course, is that the centre right tends to have had more business experience. Yet in the case of New Zealand, John Key’s experience with Merrill Lynch, Steven Joyce’s experience in the radio industry and Bill English’s farming background do not entail much hands-on knowledge of job creation. If anything – and as with Republican hopeful Mitt Romney – their cumulative business experience has had more to do with cutting labour costs and job numbers, and with tightening the economy, than with expanding it. The minister in the firing line is the Government’s so-called jobs czar, Joyce, whose new mega-ministry was meant to co-ordinate the skills training, education and planning needed to enable job creation within a modern economy. There have been few signs of progress. 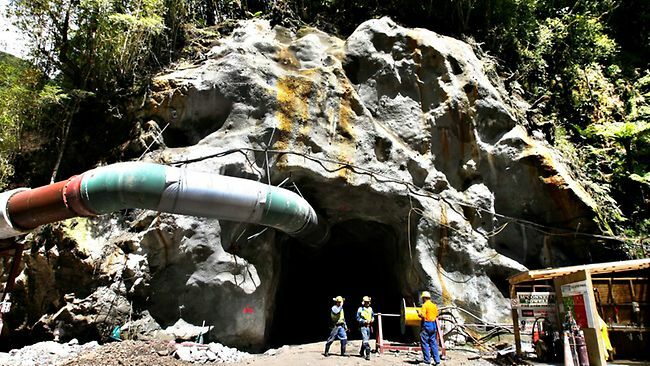 Joyce tends to blame the Opposition for opposing mining and oil exploration – as if this was the reason for the jobs vanishing from manufacturing, and for the problems facing exporters. National should be feeling concerned that like Romney, it risks being seen as focused on the needs of top income earners, and out of touch with working families. Faith can be a fine thing – but faith without good works, as the Good Book says, is nothing. I don’t think there’s anyone in New Zealand who believes David Shearer has the speechifying eloquence of David Lange or the intimate television connection of Prime Minister John Key. It’s a sad commentary on modern politics that these two skills are the basic prerequisites of any successful political leader. We live in a media world where fakery, shallow quips and acting skills are expected of any aspirant to high office. Shearer, a man with a serious job doing real work before becoming a politician, has been a bit slow to catch on. His international experience negotiating with murdering sociopathic warlords or leading disparate groups to reach outcomes that saved lives are not the sort of skills that the chattering elements of our political classes respect. His detractors leading up to this weekend’s Labour Party conference seem to home in on his lack of ability to master sound bites and speaking without pauses. 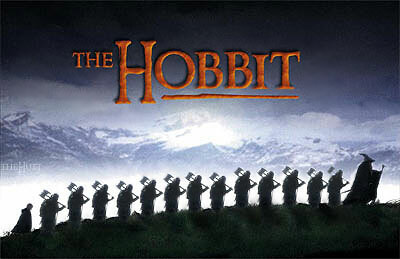 For that crime, a vocal firing squad demands he be replaced by the earlier defeated nominee David Cunliffe. I’d be more sympathetic if the tension was about policy differences. But it’s not. All the future leadership contenders are singing from the same policy hymn book. The criticism boils down to style and presentation. 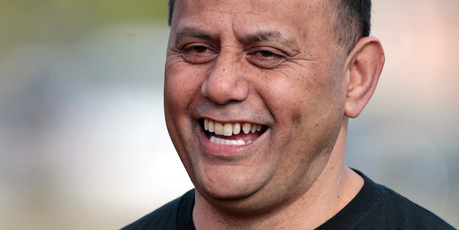 There’s no doubt Cunliffe is a gifted performer. What is discomforting is his every nuance and action seems calculated. With Shearer you can sense his real character. With Cunliffe, I can’t escape the feeling that he has the same phoniness as the Republican US presidential nominee Mitt Romney. You couldn’t find a better example than Guyon Espiner’s superb piece in the NZ Listener. Presumably, it was timed to remind the Labour Party faithful a few days before their conference that Cunliffe is still a viable alternative for those with buyers’ remorse on Shearer. The original Ponsonby cafe interview venue was changed because the subject didn’t want his potential blue collar supporters to think he was some latte-sipping w***** swanning around Auckland’s liberal ghetto. The fact he lives a stone’s throw from Ponsonby Rd (miles away from his New Lynn electorate) reveals more. Cunliffe’s angst with his interviewer about where he should be photographed was plain narcissism. Not at the beach as he could be lampooned as if his career were drowning; not on a lawn or he could described as a snake in the grass. A satire scriptwriter high on cocaine couldn’t make this stuff up. The point I’m making is that obsessing about managing superficiality in the media shouldn’t be prioritised over character. That said, Shearer’s public presentation weakness is real. He hasn’t understood the importance and urgency of overcoming this problem. After this week we can safely conclude he has got it now. But let’s be fair, this guy has been in the leadership for nine months. Everyone waxes over the formidable presence of Clark. Have they forgotten Clark’s early years as party leader? Remember when she was 2 per cent in preferred leader stakes? It took years for her to get out of single figure poll support. She had to get a new hairstyle, a new voice and a new wardrobe and lead the party for six years before victory. What you want from a leader is political success. For that you need only look at the recent polls. Under Shearer’s leadership the gap between Labour and National has halved from 20 points to 10. In the past three polls Labour, the Greens and NZ First have together outpolled National and her allies. Shearer’s personal ratings surpass anything Goff got or Clark reached in her early years. Shearer’s success is remarkable given he is up against our most popular prime minister in living memory. I would have thought a standing ovation was in order. Provided Shearer takes some serious time out over the summer to work on his media and presentation skills, and assuming in the new year he shows courage by promoting talent over non-performers onto his front bench, his party will coast to victory at the next election. A bit of unity and patience wouldn’t be a bad thing. A full meeting of Maritime Union members at the Ports of Auckland was held this morning Monday 12 November 7-9am at Auckland’s Maritime Club. 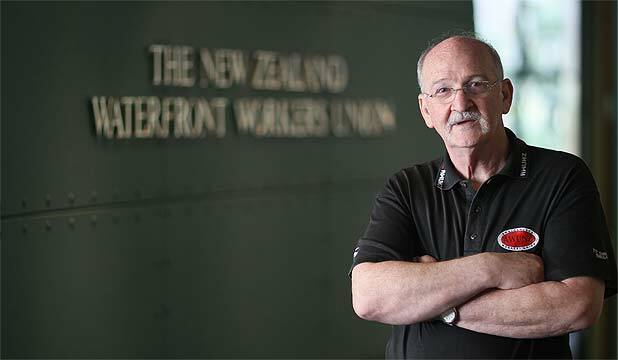 Maritime Union of New Zealand National President Garry Parsloe says members voted with overwhelming support to back the Union to achieve a settlement of the ongoing dispute. The members have reluctantly accepted concessions the Union has made in the facilitation to try and get progress, he says. "However, Ports of Auckland workers are shocked their employer continues to want to destroy basic terms and conditions that provide for some balance in this 24/7 industry and which threaten the health and safety of the workforce." Mr Parsloe says union members will not agree to unfair rostering which would undermine family life, with no certainty of start times, the ability for casuals to be used for any duties thereby removing a career path for workers at the port, and the loss of the limited right of one guaranteed weekend off in every three. He says workers will not sign a POAL contract that continues to contain a contracting out provision after what they have been through. "Our members will fight these changes however they can." Mr Parsloe says any decision to take industrial action would be very seriously considered as we are aware of the costs to our members and disruption to the city. "We cannot however stand by and let POAL progress this attack on our members and their families." Ports of Auckland workers at the meeting called on the Mayor of Auckland to sack the CEO and the Board and restore a moderate management who respects its workforce, says Mr Parsloe. 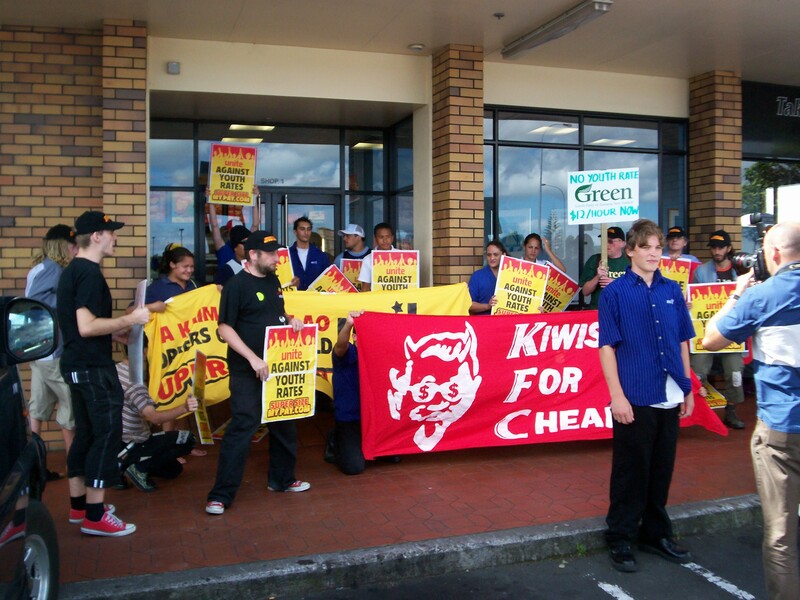 "They do this in the name of their families, the city of Auckland and New Zealand workers. The mayor and council can fix this if they want to."